Hands up how many of you have gone through life without making mistakes? If there are any hands up now there is one word for you; liar! Mistakes are all part of the great learning curve known as life and learning from past ones make us stronger, better people who know what not to do next time. This is a scenario being carried out in businesses every day across the globe. Even the biggest ones makes mistakes, and a quick look online will give you numerous lists of the most expensive faux pas made by those who should really know better. If somebody you know through work has dropped a clanger and is feeling bereft and pretty stupid the last thing they need is false sentiment. These Mistaken business ecards are the ideal way to let them know that you are behind them and that they can move on from this and learn from it. 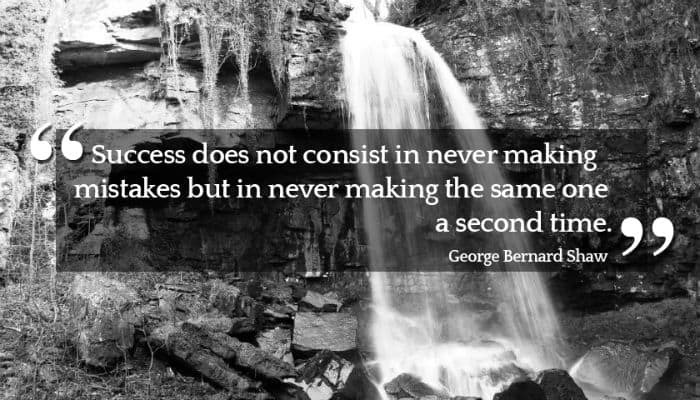 A striking monochrome image of a waterfall lies behind some words of wisdom from George Bernard Shaw; “Success does not consist in never making mistakes but in never making the same one a second time”. A mistake is a setback, not the end, and this is the e message you can send to that person. We would love for you to consider using us this year for your Christmas holiday marketing with our sensational business holiday ecards. Pop over and have a play with our designs.